And after that they had mocked him, and they took the robe off from him, and put his own raiment on him, and led him away to crucify him. And as they came out, they found a man of Cyrene, Simon by name: him they compelled to bear His cross. 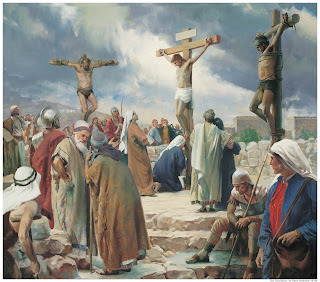 And he bearing his cross went forth into a place called the place of a skull, which is called in the Hebrew Golgotha: Where they crucified him… And Pilate wrote a title, and put it on the cross. And the writing was, JESUS OF NAZARETH THE KING OF THE JEWS. ...Jesus had the power to save himself from all of this suffering and death. Why didn't he? Easter Countdown Day 12: He is Risen!